The second new feature is a Parent Portal Mobile App. If you have an iPad, iPod or iPhone you will be able to check your student’s grades on the go. Also, if you have a Blackberry or Android device you can connect to the parent portal with a browser, and it will launch specialized mobile pages for you to access your student’s info. More info will be made available regarding the Mobile App – this document will focus on single sign on. 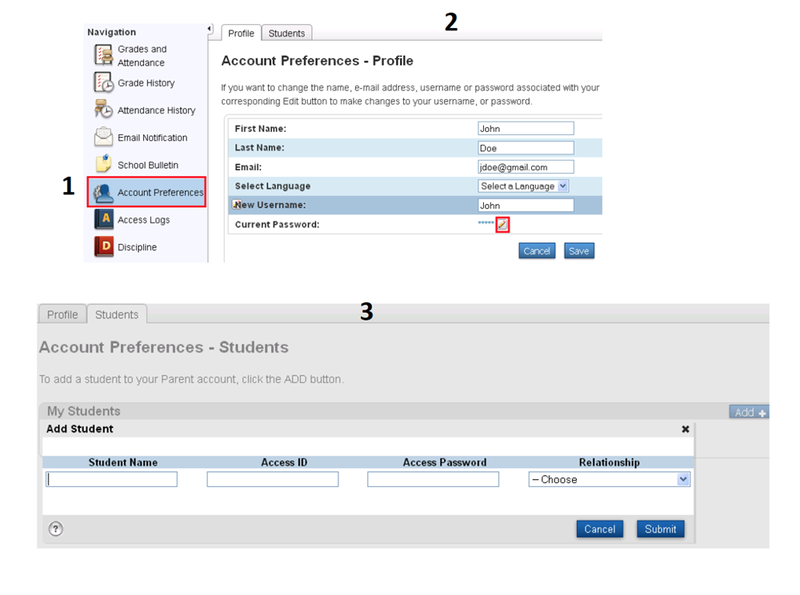 Create your new account by completing the parent access boxes. The username you select will be the new username you will use to access the account. Please select a secure password. Link students to your new account. The Access ID and Access Password for each of your students is included in this letter. The Access ID and Access Password are the IDs and Passwords used in previous years. Use your newly created username and password to sign in. If at some point you forget your username and password click the Having trouble signing in? link. You will need to know the email address used for the account. After you login you are able to make changes to your account. Click on the Account Preferences link. You can change any of the fields listed. Click on the to edit the Username or Password then click Save. Click the Students tab then Add to Link other of your students to your account.